CTE Measuring Frame - Gilson Co.
HMA-114 CTE Measuring Frame allows for simultaneous testing of two concrete samples, increasing the testing efficiency of HM-271 Concrete Coefficient of Thermal Expansion Test System. The specimen measuring frame is adjustable and heavy-duty, constructed of corrosion-resistant Type 304 stainless steel. 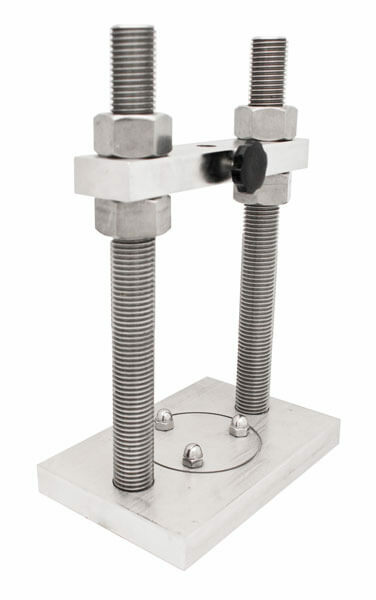 It offers uniform expansion characteristics needed for precision testing to AASHTO T 336 standards. Tests 4x7in (102x178mm) DxH samples and is adjustable for sample heights from 4 to 8.5in (102 to 216mm).